As explained on the Étretat page, our intended sojourn in Honfleur was subverted by the ravages of its recent touristic explosion--a veritable invasion of English, American, and assorted European travelers, drawn to its incredibly photogenic old port, architecture, reputation for Normandy cuisine, and for being a "quaint" seaside port. This was a great disappointment, since we'd looked forward to returning there for 15 years since our last extended visit. 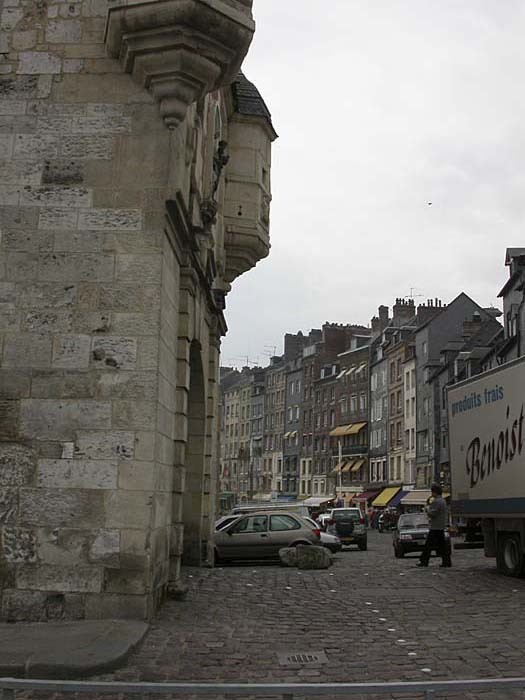 The old port is as stunning as ever with its remarkably narrow and colorful portside buildings, as the pictures prove, but our lunch was overpriced and mediocre, and there was just too much hustle and bustle to suit us after quiet days in Souillac and environs. We did walk as far as the locks that allow boats in Honfleur's inner harbor to drop to the level of the sea. Maybe we didn't give Honfleur a sufficient chance to seduce us again, but Étretat seemed a welcome refuge after our little trip back to Honfleur for lunch.